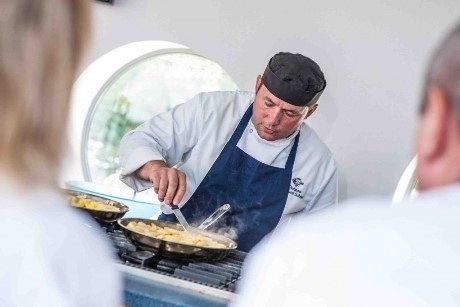 Teachers considering a Food Technology-related school trip might like to organise a visit to Rick Stein’s Cookery School in Padstow, Cornwall. The school, founded by the celebrity chef Rick Stein, offers a number of half-day workshops to Primary and Secondary school pupils that can support learning in Food Technology. These sessions can be booked on selected dates throughout the year, ranging in theme from seasonal cooking at Easter and Halloween, to general skills like learning how to cook pasta. The workshops cater for different age ranges. Primary teachers can book a children’s course suitable for eight to 11 year olds, which runs from 9.45am until 1pm. The session will see the pupils watching three chef demonstrations, before recreating each dish in pairs. The class will learn techniques such as de-scaling, filleting, pin-boning and sautéing round fish, and cooking pasta. Dishes taught on the 2016 courses for this age group have included marinated salmon with passion fruit, lime and coriander, and sautéed red mullet with parsley, garlic and spaghetti. Secondary school pupils aged between 12 and 16 years old can also take half-day courses, which run from 2pm until 5pm. Workshops have the same demonstration-followed-by-making structure as the Primary school sessions. Dishes taught in 2016 have included moules marinière, spiced fillets of flounder in warm tortillas with a fresh coriander and tomato salsa, and tarte tatin. Cleaning and cooking mussels in a cream sauce, and preparing apples for tarte tatin and caramelising them in a pan are amongst the techniques included during one of these workshops. Each pupil receives a recipe folder and certificate at the end of the day. Teachers interested in booking a cookery workshop for their pupils, or in finding out more about the courses available in 2017, can call 01841-532700 or e-mail reservations@rickstein.com. For further information visit www.rickstein.com/school.